Which protein drink should I use? There’s a lot of companies making post-workout recovery drinks and protein shakes so how do you choose which one’s right for you? First you’ll have to understand why you should use a protein drink, and if you’re new to this make sure you read this article first, then come back and I’ll help you to choose. With all these different drinks on the market, it’s important you know what to look for. This will differ slightly depending on your goal, but these are the things you should look out for. Protein – What type of protein does the drink include? Whey is the most popular and fastest absorbed into your body. Also how much protein is in each serving. Most drinks should contain around 20 g of protein in a single serving. Sugars, calories and saturated fat – These things are unavoidable in a drink, but be careful as some drinks can contain a lot of sugars and calories. Best to try and keep these to a minimum. Carbohydrates – Some drinks will contain carbohydrates too, whilst others will be really low. Think about how you’re going to use the drink. If it’s after a morning workout and you’re not going to eat for a few hours, then some carbs could be good and keep you going, if your going to use the drink in the evening, followed by a meal, then you won’t need the carbs. Creatine – Without going into how creatine works right now, look out for it’s presence in your recovery drink. This will indicate that it’s more of an all-in-one workout drink and be used to boost performance during exercise. To start with you may just want to stick to a recovery drink and find one that doesn’t include creatine, then as your workout routine matures, you may want to look into how creatine works and whether you want to use it. Without hesitation I’d always recommend Sci-MX, and it’s their drinks that I use myself. For the majority of the time I use their standard 100% Ultragen Whey Protein. 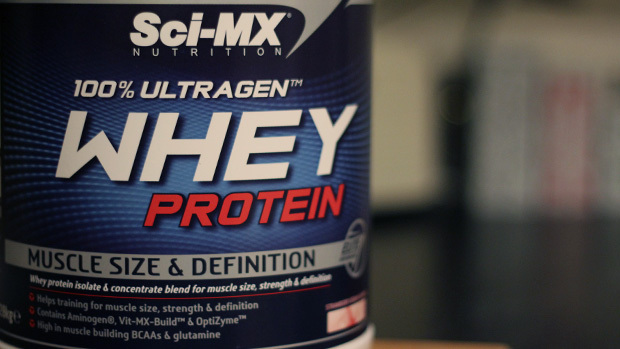 It’s high in whey protein, which is quickly absorbed but contains much more. What you’re getting for your money is the benefit of their independent research into creating a truly balanced drink. They’ve studied what your body needs in order to digest and use the protein most effectively and what needs replacing in your body after an intense workout. The other drink that I use from time to time is a little more advanced, and it’s called Build and Trim Whey Protein. This has all the benefits of whey protein, but also contains their scientifically researched fat loss ingredients; CLA, Actilight and Vit-MX-Trim. This will help muscle recovery and aid fat burning. This should be used if your trying to slim down, tone up and get strong. But think core-strength strong like a martial artist, if you’re trying to build bigger muscles then you should stick to the Ultragen instead. I keep both Ultragen and Build and Trim in the house and use them at different times. Most weeks I’ll be lifting weights, doing pull ups and push ups and I’ll be taking the Ultragen. But every now and then I’ll switch it up a bit and do a week of cardio exercise and core strength work and this is when the Build and Trim comes in useful.